Lots of people think that semi- and demi-permanent hair color are the same thing, but they’re not. Read on to find out exactly what they are and if one of them is right for you. We know the hair color terminology you’ve heard at the salon often sounds like another language. So we’re here to translate. Up next: Breaking down semi-vs-demi-permanent hair color. The biggest difference between semi and demi is permanency. Though both are temporary, demi lasts 24 to 28 shampoos, and semi lasts 3 to 6. 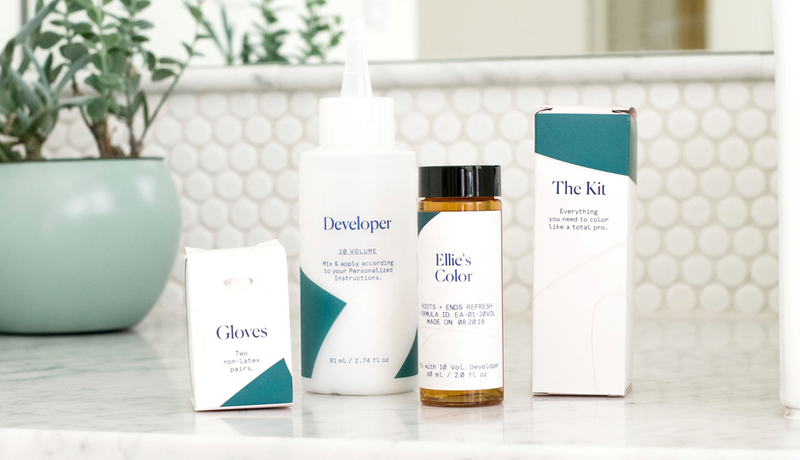 We’ll go through exactly what they are, and why you would use them, with tips from our colorists to help you get the best results. Read on to find out more of the differences between these two popular picks. Demi-permanent hair color is ammonia-free and mixed with a low-volume developer, so it washes out after about 24 to 28 shampoos. Applied to dry hair before you shampoo, it works by depositing pigment on the surface of the hair. It doesn’t actually penetrate your strands or lighten your color, but it does last much longer than the more-temporary hair color options out there. Demi-permanent is great for anyone who wants a temporary color change, or for folks who are looking to enhance their current shade with a new tone. Plus, it’s also great for people with less than 25% gray. Why only 25%? Because demi-permanent hair color only lives on the surface of your hair follicle, not allowing for any color to really get in there and cover up your grays. It will however, give your grays a translucent “highlighted” look, which might help them blend in a bit more with your overall shade. Demi-permanent hair color lessens the appearance of regrowth. Demi-permanent creates a “diffused” finish, meaning a softer transition between your current color and your growth. Aka, no blatantly obvious roots. However, while this is true for folks without grays, demi will not fully lessen the appearance of gray regrowth. For total coverage, you’ll need something a little stronger—like a permanent hair color. Or for a quick-fix, try our root touch-up spray. Semi-permanent is a deposit-only, temporary hair color that stains the hair for about 3 to 6 washes. Unlike demi, semi-permanent color does not need to be mixed with a developer, and is typically applied to freshly shampooed hair for the best result. In addition to coloring your hair, semi can even temporarily enhance the tone of your hair, adding a little extra oomph in between color applications. Fair warning: Semi tends to show up a bit darker on your hair than it does in the bottle. 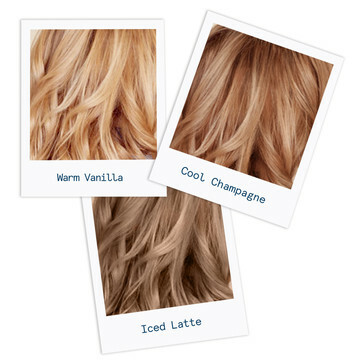 We recommend choosing one shade lighter to get the color you want. It may sound funny, but trust us on this. Semi-permanent hair color is for people who want an even more temporary hair color change than demi, since it fades almost 5X as fast. And with its super-quick fade, semi is a great choice for anyone who wants to experiment with a bright color for the weekend. Want your semi to wash out much faster? Use a clarifying shampoo or add a few drops of Tea Tree Oil to your shampoo for a quick DIY option. 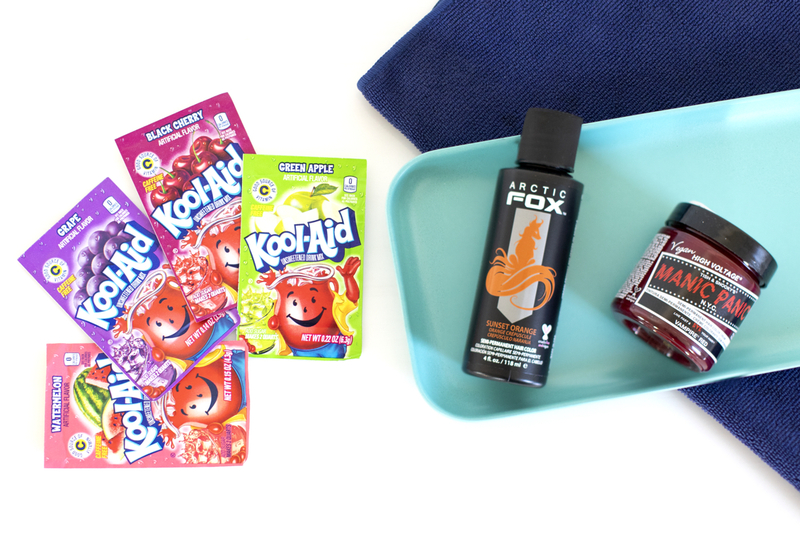 Kool-Aid is considered a semi-permanent hair color. Kool-Aid is not a semi-permanent hair color simply because it's just too weak. 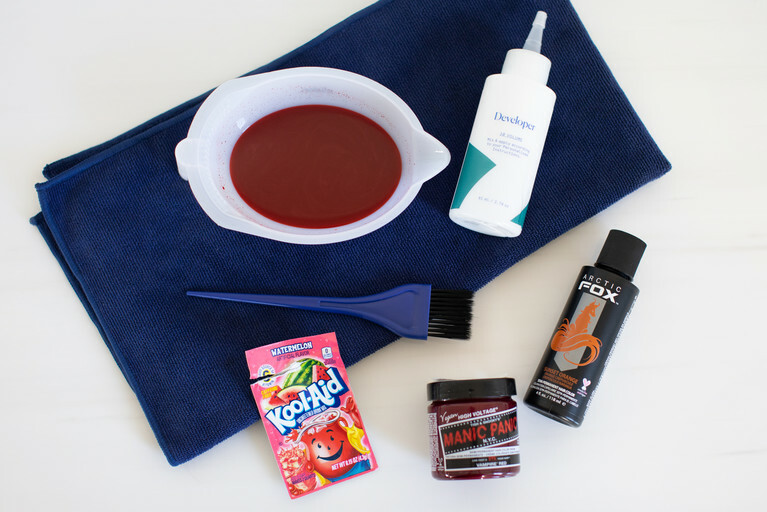 The classic summer juice may be able to stain lighter hair red or blue, but "just add water" and the color will wash right out. True semi-permanent colors have stronger pigments that may last up to 6 washes. Sorry, giant-smiling-punchbowl man. 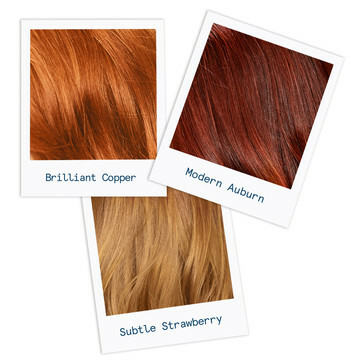 Now you have everything you need to decide whether demi- or semi-permanent hair color is right for you. To ask our colorists more hair care, color, and style questions click here, scroll down, and submit your questions at the blue bar. And while you’re at it, join the conversation on social via Instagram, Pinterest, Facebook, and Twitter.